The Perfectorium team has developed an information site for the Advance IT training center, which conducts and develops advanced training courses for specialists in the management and development of IT business. 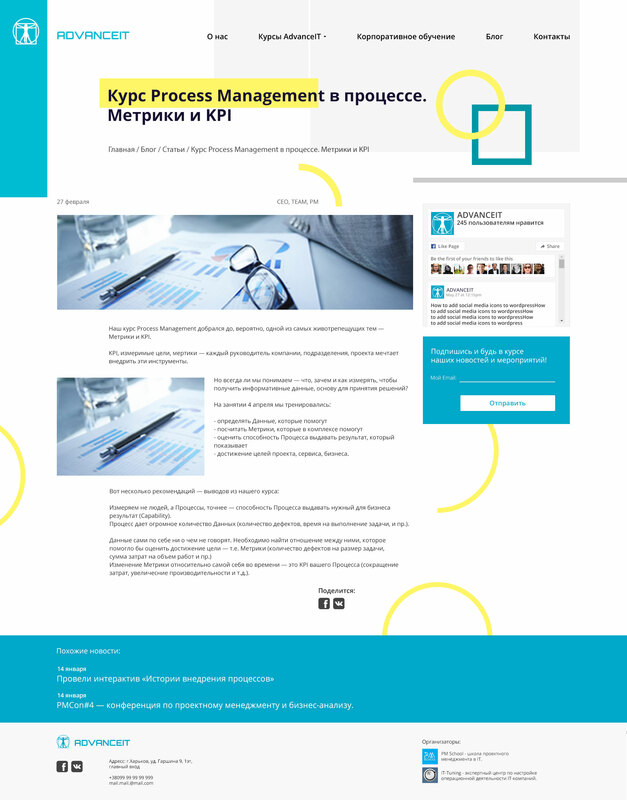 Key values ​​of the company, such as practicality, relevance and availability, have been successfully displayed in the concept of a web site, which provides convenient access to all necessary information by users..
As a CMS, the WordPress system was chosen, because it fully meets the requirements of the client. This CMS is elementary in using for client. The user can choose a course using live search, based on the specialization, complexity and type of the course (online / offline). 2) Presentation of the courses. The intuitive and user-friendly structure of the course page highlights key details, which makes it possible to effectively compare courses. For compactness of the categories of News, Articles and Events have been implemented by tab. In addition, developers allowed to specify an external link to each of the tabs, which also allows search engines to index this content. 4) Convenient feedback with instructors and course organizers. Selection of results occurs without reloading the page. The site is made in a minimalistic – chaotic style, to provide a comfortable and intuitive interface. To create a creative design, the concept of “managed” chaos was used. Dynamics is achieved by animating the Elements on the Main page, Registration forms, a pop-up menu. The site was adapted to all common devices. For the compactness of the mobile version, the content in the tabs is combined into sliders. During development, special attention was paid to performance. For this purpose, our team decided to minimize the use of plug-ins, as well as third-party libraries. Most of the functionality was implemented using the basic functionality of the WordPress CMS. A plugin was implemented to display user data from completed forms. The whole project was executed by our wonderful Perfectorium team.